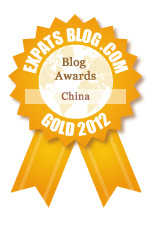 ExpatsBlog.com Expat Blog Awards 2012: China Gold Award! This blog won the Gold Award for best expat blog in China! Very funny blog! Read it quick before the Chinese sensors catch on! Hilarious Blog, witty and razor sharp observations! If you share in the often redonkulous adventures of a an expat in China, this is your go-to blog for laughs! This man is hilarious. Read this ****. Funny anecdotes and links to relevant news stories, posts just the right amount. Good stuff! Even those who have never even been remotely close to China will get a huge kick out of this blog. I absolutely LOVE reading this blog! Funny, witty and full of laughs! Clever funny twists with his words, and Michael sets the scene for his adventures and stories well. Michael's blog is the most insightful, witty and brilliant depiction of life in Shanghai I've ever seen! His commentary, photos and astute observations are extraordinary! Keep up the great work, Michael! I look forward to your next posting! Insightful and very funny at the same time -- and great photos!! A good eye for irony, and great photos! What a wonderful combination of humor, irony, and purpose! Very clever, thoroughly enjoyable, and great photos! Awesome blog. I keep up with it regularly and enjoy the interesting links and news. Personal stories are definitely my favorite! As a fellow Expat, it's certainly interesting to see how other Expats are doing in Shanghai. Your writing is wonderful, as always. I can't imagine any other expat blog to be as insightful, observant, and out-and-out hilarious as Hai from Shanghai. Having recently visited Shanghai and Lijiang, I've found this blog to be more rewarding than ever. Yes, why can't I check 6 stars!